If you read my previous post, welcome back! Sorry it took me months to finish the second post of my SF trip. This time I have a legit excuse 😛 Me and my hubby is relocating our family down south to U.S.A! *details will follow…* Long story short, me and my hubby is finally settling down at our destination in California. My hubby drove for literally 1000 miles from BC to California over 4 days! But we did enjoy the trip and saw beautiful things along the way *wink… another blog post 😛 Okay okay… back to the blog post…. 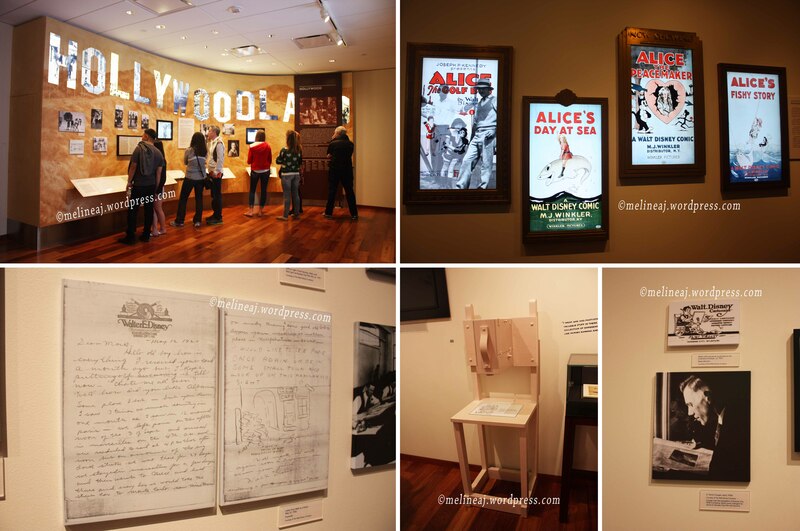 After having a satisfying breakfast, we decided to visit The Walt Disney Family Museum in Presidio area. 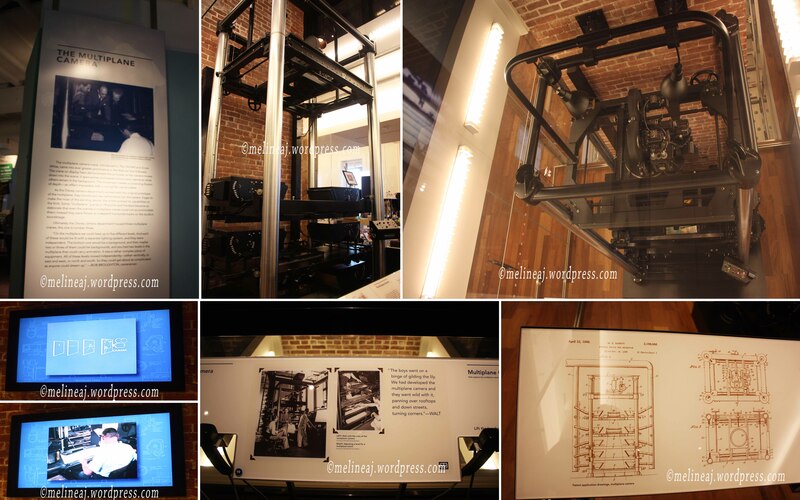 At first, I was a bit hesitant to visit when I saw this small museum on the internet. Since I visited most of SF attraction in 2007, I decided to give it a try. 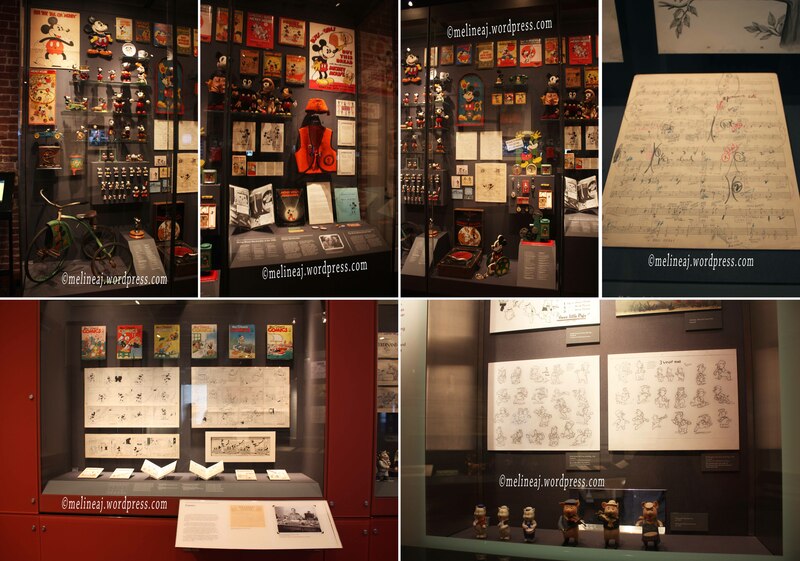 To my surprise, this museum is pretty big and it contains lots of Walt Disney memorabilia as well as lots of stories behind the Mickey Mouse creator. 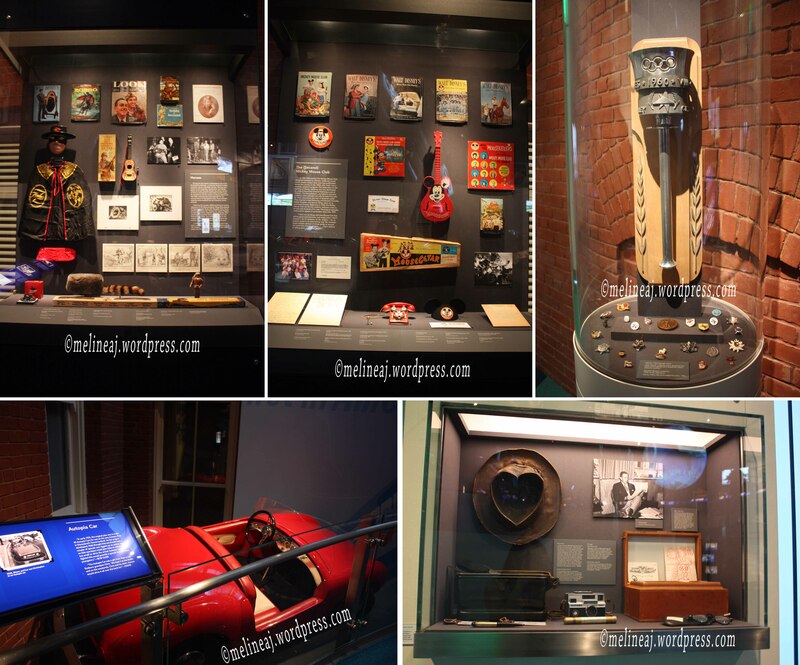 The museum does provide the visitor with lots of information from the creation of each character, the construction of Disney World, how Walt revolutionized animation in television, the biography of the famous ‘father of fun’ himself, and various awards given to Walt Disney movies. It truly is the place where Disney fans can enjoy! There is a lot of paid parking near the museum. We arrived there at around noon and the line up for admission ticket was quite long. The ticket for museum only is $20; while the museum & special exhibit combo ticket is $25. The special exhibit changes regularly. 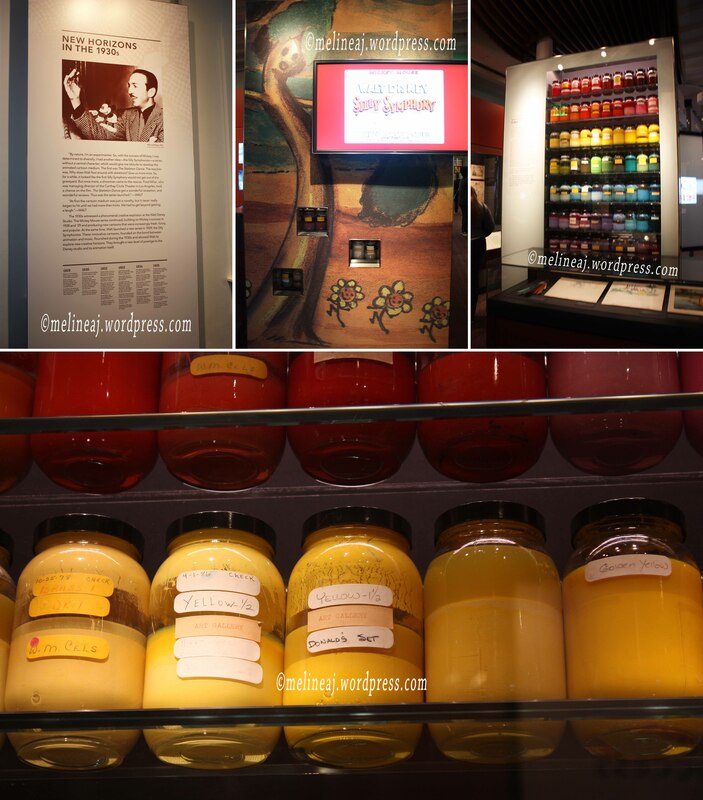 When we were there, it was “Water to Paper, Paint to Sky: The Art of Tyrus Wong” (ref). If you want to avoid the crowd, you can buy the ticket online and redeem it at a special desk. We opted to buy the museum ticket only since my hubby is not a fan of paintings. Behind the ticket desk, there are glass cases containing various awards given to Walt Disney production. This includes Oscar, Emmy, and other prestigious awards. 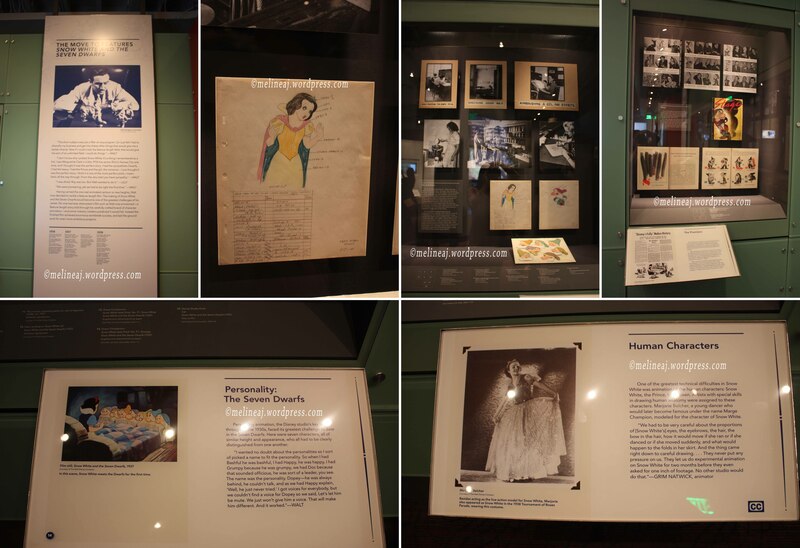 At one tiny corner, there was a picture of Diane Disney Miller, the oldest and only biological daughter of Walt Disney (later, Walt and Lilian Disney adopted Sharon Mae Disney). This little shrine is dedicated to Diane who passed away on November 19, 2013. 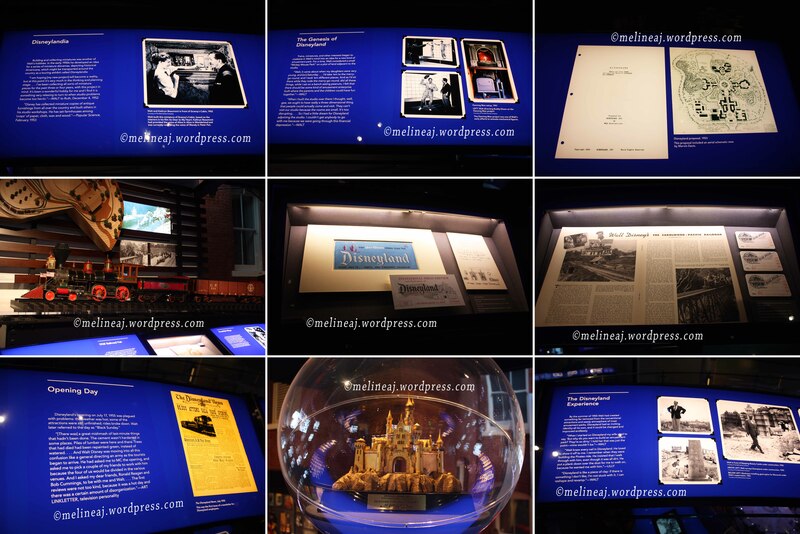 The first part of the museum is the biography room of Walter Elias Disney and his family. It was started by a story about how his mom and dad met for the first time. There is also an interactive display telling how Disney family moved from one city to another in a hope for a better life. There are also authentic pictures of Walt, his parents, and his siblings on the wall. The last part of the display tells how young Walt Disney faked his age to be able to participate in the war. Once we exited the biography room, we went upstairs by an elevator decorated as if it was in the 20’s. This brought us to a Hollywood room where Walt Disney’s career as an animator began. Alice’s Comedies series are Walt’s and his brother’s, Roy, first success that combines “live-action/animated shorts based upon Alice’s Wonderland” (Gabler, Neal (2006), Walt Disney: The Triumph of the American Imagination, New York: Random House, ISBN 0-679-43822-X). Oswald the Lucky Rabbit is Walt Disney’s all-animated series that became popular very fast. Due to Universal’s rejection for Disney’s salary increase, Disney decided to part with the company. This costs him the Oswald trademark and most of the animator staffs. In 2006, The Walt Disney company successfully acquired back the intellectual property of Oswald (http://en.wikipedia.org/wiki/Oswald_the_Lucky_Rabbit). Soon after losing Oswald, Walt Disney created the most recognizable icon in the world today, Mickey Mouse (http://en.wikipedia.org/wiki/Mickey_Mouse). The first silent film featuring Mickey and Minnie Mouse as the stars didn’t attract any distributor. Hence, Disney created Steamboat Willie (http://en.wikipedia.org/wiki/Steamboat_Willie) in which he performed all of the voices in the film. The synchronizing sound is the technique he used to add the sound effect into the movie. In 1932, Disney collaborated with Herbert Kalmus to shoot Flowers and Trees cartoon using three-strip Technicolor camera (http://en.wikipedia.org/wiki/Walt_Disney). As a result, the cartoon won the first Academy Award for Best Short Subject: Cartoons! Soon after, Disney created another characters (Donald Duck,Goofy, and Pluto) to accompany Mickey and Minnie in the cartoon. Between 1934-1937, Walt Disney produced its first long animated feature, Snow White and the Seven Dwarfs. He went through financial strain and was opposed by his own wife, Lilian, and brother, Roy while producing the film. Finally in February 1938, the first animated feature in America made in Technicolor was released! And nothing but applauses were given! Snow White was the most successful movie in 1938 that won an Oscar!!! The only scene from Snow White that I vividly remember was when the Evil Queen disguised as an old lady giving Snow White a poisoned apple. After watching this movie, I always became cautious to stranger when someone I don’t know try to ask me something. A good way to teach your kids a lesson! hahaha… I also vaguely remembered that I became scared looking at the mirror after watching the movie since I thought all mirrors could talk back to me like the Evil Queen’s one ahahaha…. Bambi is one of the Disney’s movies that I remember the most. When I was a baby, my parents bought a plastic wash tub to bathe me and it has Bambi picture on it. For some reasons, it imprinted on my mind so strongly and I always feel that I’ve known Bambi for ages! *although honestly I don’t really remember its story* Disney adapted Bambi from Felix Salten’s book Bambi, A Life in the Woods (http://en.wikipedia.org/wiki/Bambi). Although the movie fell short at that time, it has been listed as one of the American classic films in 2008. On December 24, 1939, Walt Disney Studio opened its door for the first time in Burbank, California. Walt Disney was able to build this campus following the success of Snow White. Not long after, World War II broke and there was a three-month artists’ strike due to financial constrain in the studio. This forced Disney to creatively restructure the studio. Post WWII, the studio released “Cinderella, which became Disney’s most successful film since Snow White and the Seven Dwarfs”(http://en.wikipedia.org/wiki/Walt_Disney). The amazing invention is the multiplane camera created by William Garity for the Walt Disney Studios that was used in the production of Snow White and the Seven Dwarfs (http://en.wikipedia.org/wiki/Multiplane_camera). This special camera gives the depth perception in the cartoon so that the animation has 3D feeling. Click here to see how it works. 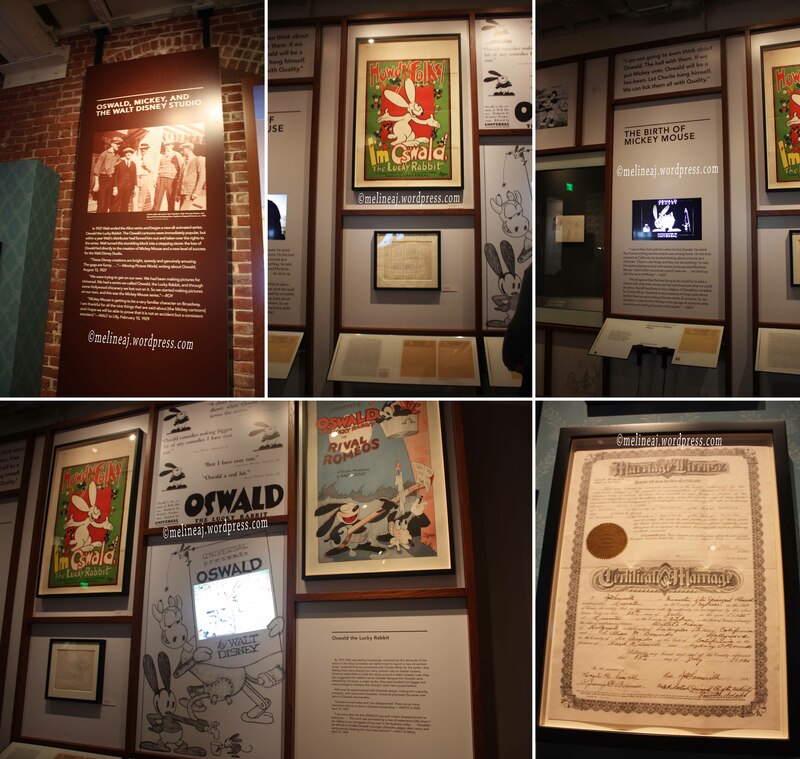 During WWII, the studio involved in war propaganda as in the posters and patriotic cartoon. Post WWII,Walt Disney Studio branched to incorporate exotic theme, such as Latin American, as it became more popular world wide. 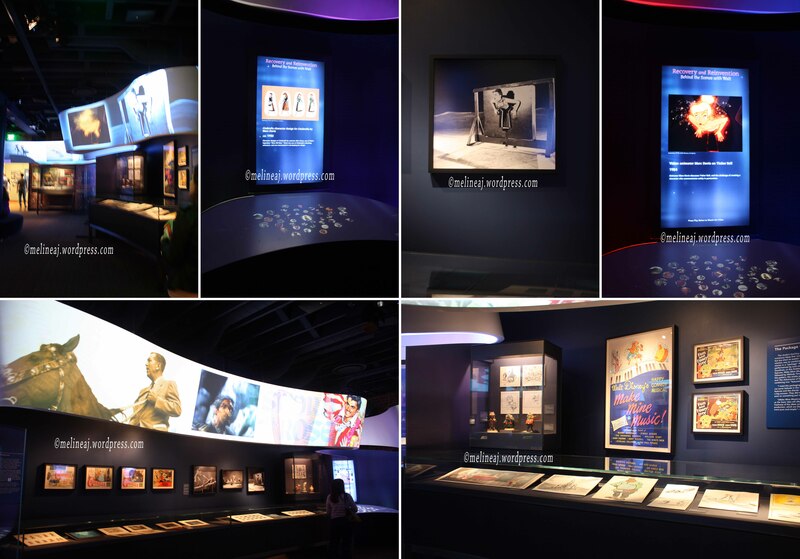 At the end of second floor exhibit, there is a cool interactive room in which you can choose whatever character you want to know on the touch screen and it will give you the fun facts. 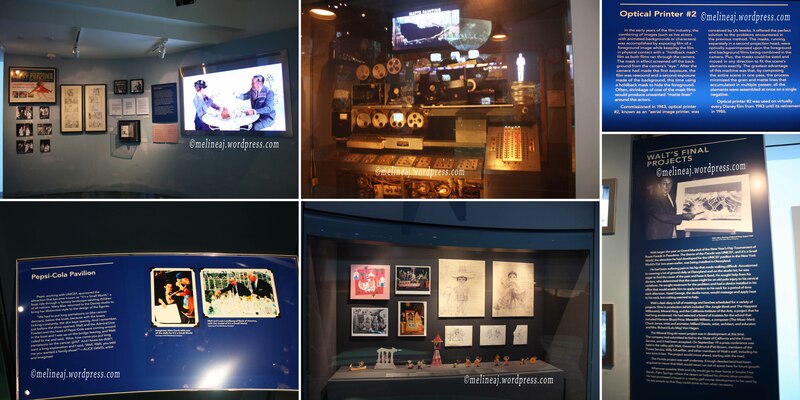 There are also vintage posters and sketches in the glass boxes. Moving on to another part of the museum, there were glass windows overlooking the Golden Gate Bridge. The view was really breathe-taking! At the end of the hall, there is a green bench that was originally from Griffith Park Merry-Go-Round in Los Angeles. The idea of creating a theme park came to Walt Disney way long when he still lived in Kansas City. When he moved to Los Angeles with his family, Walt Disney made frequent trips to Griffith Park to let his daughters go on merry-go-round. It is believed that from sitting on the green bench, Walt Disney made a lot of observations about parents and children. Hence, he pledged to make a better theme park where both adults and young kids can have fun together. This was the birth of DISNEYLAND! As soon as I entered the exhibit room, I saw the Disneyland miniature. 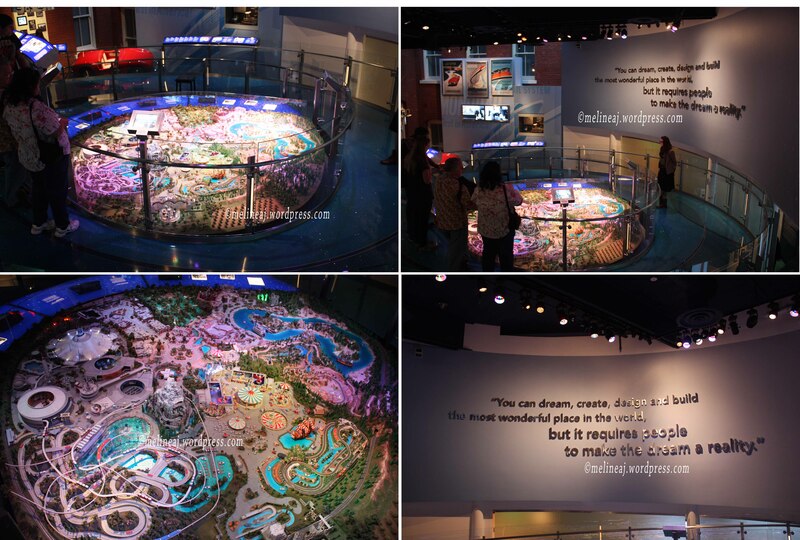 On the path toward the miniature, there are boards describing the development of Disneyland, the first Disneyland ticket, the original model of Fantasyland Castle, and even a newspaper publishing the grand opening of the park. Passing the Disneyland miniature, there are glass boxes containing props from various Disney movies. Following the success of Disneyland in California, Walt Disney planned to make another theme park called Disney World in Orlando, Florida in late 1965. While Disney did the planning for the theme park that includes EPCOT (Experimental Prototype Community of Tomorrow), unfortunately, he didn’t get a chance to see the opening of Disney World. On December 15, 1966, Walt Disney passed away from his lung cancer complication. This is a sad sad news for many people around the work who enjoy Disney’s creative works but don’t worry, Disney’s legacy always lives on until nowadays. My mom is *secretly* a Disney big fan! I remember that I watched Snow White, Bambi, Sleeping Beauty, Aladin, Beauty and the Beast, Pocahontas, Mulan, and others Disney animations when I was a kid. Knowing the story of the man behind the iconic mouse inspires me a lot! His fame is not without tears, hard work, and creative mind! The most valuable thing I learn from Walt Disney is that you can always dream big and work hard to achieve it. No matter how many falls you stumble upon, you must be able to pick yourself up and continue to what you’re pursuing. After a day full of inspiration and fun, we visited Palace of Fine Arts at the end of Presidio since it was on our way back to the apartment. This Roman-Greek inspired building was built in 1915 and has gone through demolition, reconstruction, and restoration to look what it is today (http://en.wikipedia.org/wiki/Palace_of_Fine_Arts). The rotunda (the building with the dome) has become an iconic postcard picture around the world. Me and my husband enjoyed a short walk around the area and watched the beautiful swans swimming around the edge of the lagoon. We headed to Chinatown at night to have Chinese food at R&G Lounge. It was super crowded inside and we had to wait 45 minutes to be seated. We ordered Peking duck and a vegetable dish. Overall, the food were good.